This ROM hack makes many changes in order to enhance the original game. 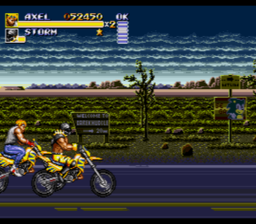 Most notably this includes having the lost Round 6 hidden areas and the deleted motorbike stages restored into the game! Finally, we can play Bare Knuckle III uncut, as it was originally intended! At the time of release this was still a work-in-progress, so naturally there are still some bugs. Unfortunately the team has discontinued work on this groundbreaking hack for now. Also converts text to English from Japanese as well!